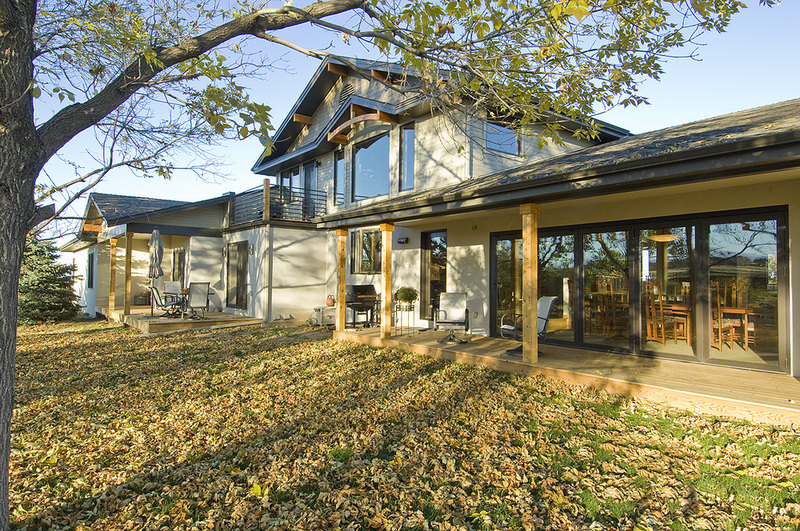 The home is situated on a three acre lot with stunning views to West of Long's Peak. The original home did not take full advantage of the mountain views and had a very closed and dark floor plan with dated finishes. The clients wanted a modern and light filled home that was comfortable and provided ample space for entertaining guests, and which reflected a casual Colorado lifestyle. The main floor was enlarged for the addition of a luxurious master suite and a dining room with a sliding glass wall that opens up to let in the view of the Rockies. The award winning kitchen was completely remodeled with an open layout. The modern stainless steel appliances, recycled glass tile and wood finishes can be admired from the light filled loft above. The clean contemporary lines of the interior are complemented with the refined timber arch of the entry and the rustic stone and stucco of the Colorado style exterior.